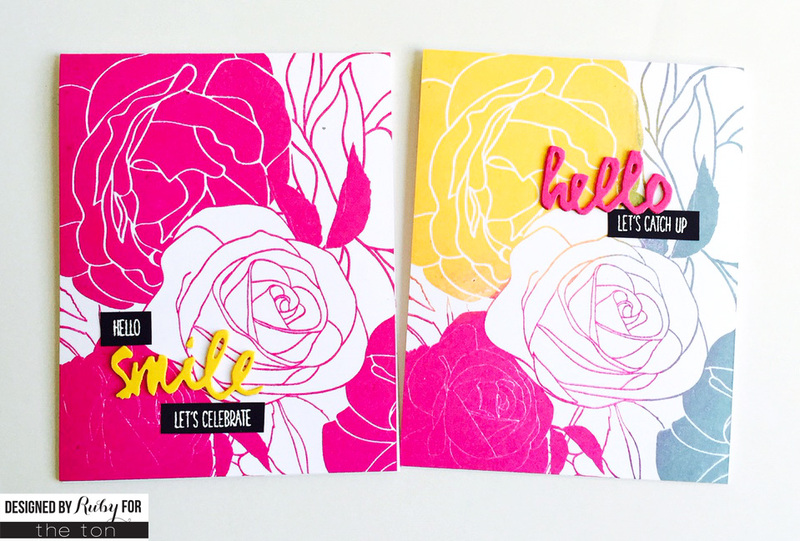 Hello, Rubeena here with a few cheerful cards! Who wouldn’t love receiving these? These were so easy to make. The MISTI sure does help to get crisp stamping! Whenever I feel stuck, I pick a few colors and use them to create various projects. I started with yellow, pink, and aqua colors in mind for these cards. For the polka dot ones, I stamped Polka Dot Cling Background in three colors. Since I wanted the polka dot background to be visible, I only added some basic sentiments. I’ve always loved the contrast between black and colors so I stamped sentiments from Hey Foxy onto black cardstock and heat set them with white embossing powders. Look at how they pop. I added some die-cut words, too. For the next pair, I stamped Marvelous Cling Background in the same colors. For one, I added cuts from Petal Cut Peonies Standalone Dies and a sentiment. For the other one, I added a Dark Pink Heart Gem and the sentiments from Pyrotechnics and Princess Cut Diamonds. For the last set, I used Rose Garden Cling Background. What a beauty this is! I stamped one in only pink and the other one in the three colors above. 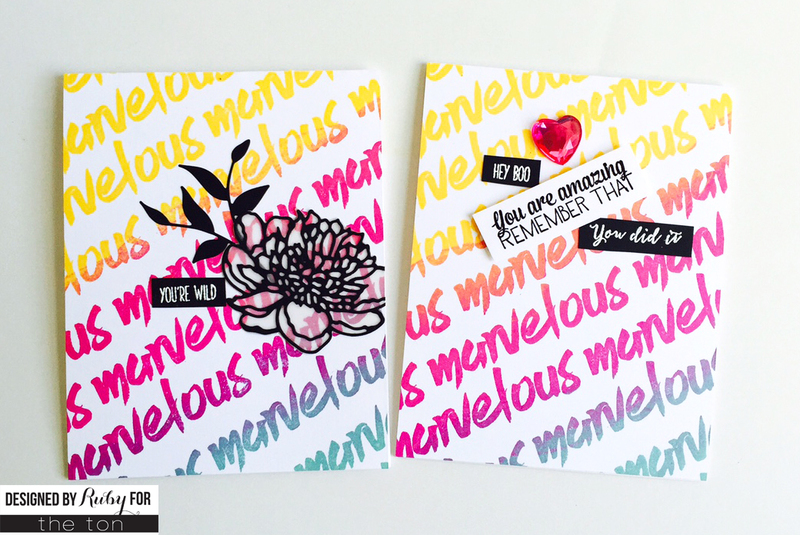 I wanted these backgrounds to stand out, too so I added die-cut words and the sentiments from Hey Foxy. Many of you should have received your orders from the latest release. I am so excited to see what you all create with the stamps from The Ton! Be sure to tag us so we know. 🙂 Have a great week! 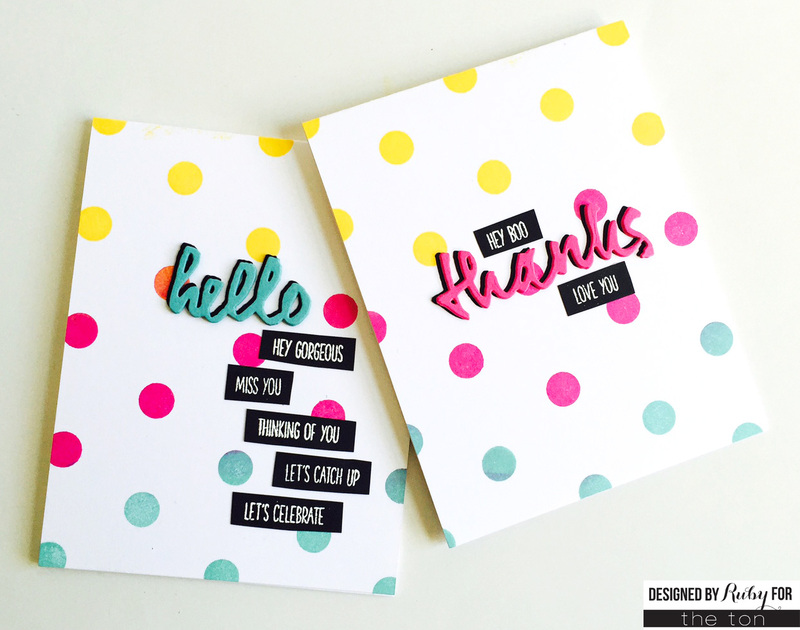 PERFECT pairs of BRIGHT & CHEERY cards!!! LOVE the colours and designs Ruby!!! … my secret goal is to start making some multiples of a few cards over the next few months, so that I don’t keep falling behind and have a last minute rush to have them ready, so your idea is very timely and appreciated!!! Wow…look at these gorgeous backgrounds at The Ton! oh wow, I LOVE these bursts of happy color! Sooo bright and fun!! LOVE them! Love those bright colours with the black, reminds me a little of Pop Art. So very cool Ruby!!! !